Trump administration provides details on sanctions against Iran that snapped back into place on Monday. The measures, suspended in 2016, largely target Iran's oil exports by seeking to block dealings with Iran's banks, as well as its shipping and aviation industries. The administration says China, India, Italy, Greece, Japan, South Korea, Taiwan and Turkey will be allowed to continue importing Iranian oil for a limited time. The Trump administration on Monday renewed sanctions against hundreds of entities throughout Iran's energy sector and its broader economy, promising to exert more pressure on the Islamic Republic. The return of sanctions, first implemented during the Obama administration, fulfills President Donald Trump's vow six months ago to ratchet up pressure on Iran, despite widespread international criticism. The Trump administration says it will lift the sanctions only after Iran's leadership in Tehran accepts its list of 12 demands. "The Iranian regime has a choice. It can either do a 180-degree turn from its outlaw course of action and act like a normal country or it can see its economy crumble," Secretary of State Mike Pompeo said at a press conference. Iranian President Hassan Rouhani on Monday said Tehran will evade the sanctions and keep pushing its oil barrels into the market, reiterating the nation's long-standing defiance. A new round of punishing sanctions on Iran's energy, banking and shipping sectors went into force overnight. The list targets more than 700 entities, including individuals, banks, aircraft and vessels. Trump announced in May The United States was withdrawing from a 2015 accord with Iran, which lifted wide-ranging sanctions on the Iranian economy. In return, Tehran agreed to accept limits on its nuclear technology program and allow inspections of its nuclear installations. Trump, who has long railed against the nuclear deal as one-sided and flawed, gave foreign companies 90 to 180 days to wind down their business with Iran. Companies that engage in sanctioned activity with Iran face the threat of being locked out of the U.S. market. The 180-day period came to a close this week, restoring a heavier slate of sanctions on Iran than a first round that went into effect after the 90-day grace period. The latest round largely targets oil exports from Iran, OPEC's third-largest crude producer. The European Union, which opposes Trump's unilateral withdraw from the 2015 Iran nuclear deal, is seeking to preserve the accord and protect the continent's companies from the sanctions. However, many European firms have cut off ties with Iran rather than risk losing access to the massive U.S. financial and economic systems. According to the State Department, companies in more than 20 nations have entirely stopped buying Iranian crude, shrinking Iranian oil exports by about 1 million barrels per day and depriving the regime of roughly $2.5 billion in revenue. Pompeo on Monday released a list of countries that can continue importing Iranian oil for the time being, including Iran's top two customers, China and India. Italy, Greece, Japan, South Korea, Taiwan and Turkey are also on the list. The waivers will allow them to reduce their purchases over the coming weeks and months. On Monday, Trump said his administration issued the waivers to prevent a spike in oil prices. "I don't want to drive the oil prices in the world up, so I'm not looking to be a great hero and bring it down to zero immediately," he told reporters. "I could get the Iran oil down to zero immediately but it would cause a shock to the market." Trump's Iran policy has been a major contributor to this year's oil price rally. 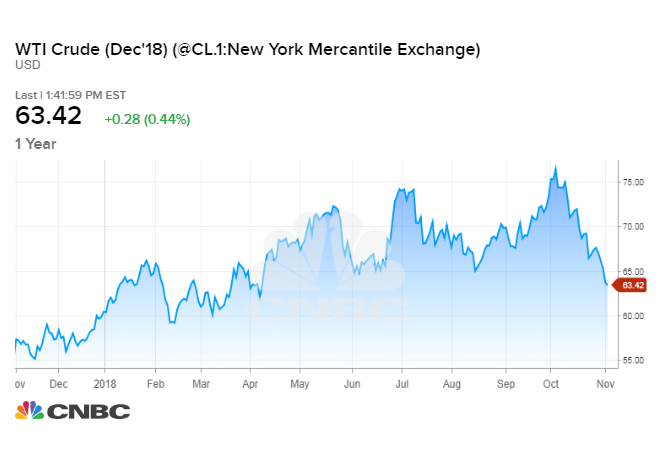 Crude futures hit nearly four-year highs last month as the market braced for the loss of the Iranian barrels. Prices have since fallen by about $13 a barrel amid a sell-off in global markets, signs of weaker-than-anticipated oil demand and rising output from major producers. Monday's actions designate 50 Iranian banks and their subsidiaries, more than 200 individuals and vessels in Iran's energy and shipping sector and an Iranian airline and its 65 aircraft. "Treasury's imposition of unprecedented financial pressure on Iran should make clear to the Iranian regime that they will face mounting financial isolation and economic stagnation until they fundamentally change their destabilizing behavior," Treasury Secretary Steven Mnuchin said in a statement. "The maximum pressure exerted by the United States is only going to mount from here. We are intent on making sure the Iranian regime stops siphoning its hard currency reserves into corrupt investments and the hands of terrorists." During the press conference on Monday, Pompeo addressed Trump's tweet on Friday in which the president posted an image of himself tagged, "Sanctions are coming," mimicking the hit fantasy novels and HBO series "Game of Thrones." Asked whether the tweet was appropriate, Pompeo criticized the media. "Much has been made of this 'Game of Thrones.' Qassem Soleimani responded, and I haven't seen any of you comment on that. This is a man who has American blood on his hands. He's killed American soldiers, and that's not funny," Pompeo said, referring to a "Game of Thrones" image released in response by Soleimani, the commander of Iran's Islamic Revolutionary Guard Corps. In fact, a number of news outlets reported on Soleimani's tweet, including The Washington Post, the Daily Mail and the New York Daily News.